When you are looking for electronic components or where to buy resistors, there are quite some options. 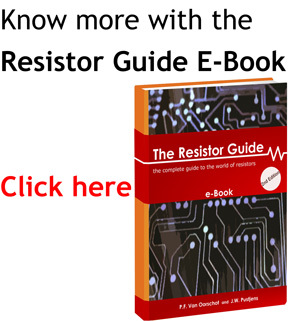 On this page we try to list some good resistor suppliers for professionals as well as for consumers and hobbyists. Solenoid valves are electromechanical controlled valves. They are amongst the most used elements in gas and liquid flows. The valve is opened and closed by an electric current through the coil. The applications are endless. A few examples are irrigation, swimming pools, sprinkler systems, washing machines, central heating, dentist tools and car wash systems. Tameson.co.uk (United Kingdom), Tameson.com (Europe), and Tameson.nl (Holland/Belgium) are specialized shops for solenoid valves with lots of background information. Sometimes it can be difficult or time-consuming to find a supplier that can fully match your requirements. In this case it makes sense to ask experts to help you. On 12supply.com you can let experts find all your technical parts in exchange for a finder’s fee. When you need just a few standard resistors or for example a simple potentiometer for electronic projects or repairing a househould appliance, it makes sense to take a look at these suppliers which are more suitable for small quantities. Their assortment is somewhat limited, but the most used components are available and in general the shipping cost are lower. A popular consumer electronics supplier, they can provide most general electronic components and provide same day shipping. Ships to the US or Canada. Recently more and more stores are selling products on amazon and you can find quite electronic components now. The advantage is that most people already have an amazon account and they have some nice offers. The choice of specialized components is still limited, but for general components and resistor kits, it has a lot to offer. A few examples of resistor products available are listed below. When you’re stuck in a project because you’re just missing that 1k resistor, the fastest solution is to run to your local radioshack. They have the basic components, you can get an idea of their assortment on the site. It is also possible to order online. When you are looking to buy more specific components or larger quantities the industrial and electronic components suppliers are more suitable. They have a very wide range of resistors, varistors, thermistors and other electronic components. Most of these companies are more focused on business to business sales, but it is possible to order there as a consumer. One of the largest worldwide component suppliers is the Element14 group, which includes the Newark(US) and Farnell(EU) brands. Their online catalog has quite good search options and if you wonder which components and specs are available you can quickly find it here.